It’s starting to feel like I’ve been pregnant for quite a long time but the thing that keeps you going and your excitement levels up are hitting the big milestones and by 28 weeks that is the second trimester behind us and we are onto the third and final trimester – yipee! At 26 weeks I have a clear bump but I still have a good majority of my trotters visible before they disappear, it might help that I already have huge feet though? My general health has been pretty good the past few weeks and I’ve been feeling healthy and active, this is only achieved by taking my vitamins religiously, an afternoon nap and my weekly yoga class. If I miss any of these things I feel the strain alot more. But hey it’s working for now so I’m gonna stick with them. At 27 weeks I said a sad goodbye to my belly button piercing, it was a tough day. After 10 years together it is very strange to look at my stomach and it’s not there anymore. I probably could have kept it in for a couple more weeks but the skin around it was getting very tight and I didn’t want it to rip – that would be gross! The best part of 28 weeks was having another scan at the hospital and seeing our little guy on the screen. He is growing perfectly on schedule and already weighs about 2.5lbs. We also got to see his face properly on the 3D scan for the first time which was amazing, usually he is hiding or has his hands over his face but this time we could clearly see him. I think he has my mouth? I can’t help but let my mind wander as to what he will look like when he is born. 26 weeks in my only maternity dress. Still plenty of room to grow in it which is good. How are you measuring: Perfectly on schedule. I haven’t started measuring my actual bump yet, I’m not too big still. Size of baby: He weighs around 2.5lbs at 28 weeks and will continue to pork his little body up for birth. Lets hope he isn’t too huge.. The doc says right now he is bang on average which is good news for me, his Daddy is a big guy. Sleep: Sadly sleep has been pretty crap for a few weeks now, I wake up alot through the night as I’m getting kicked at all angles by the karate kid or I just can’t settle into a sleep pattern. An afternoon nap is a must these days if I want to function like a human. Total weight gain: Now this bit doesn’t please me… I’ve started to pack on the pregnancy pounds boooo! The average weight gain by now is 17-20lbs and I have put on about 15lbs I think, I still haven’t worked it out properly because I just don’t want to know. No stretch marks yet. Symptoms: Lower back pain is a real tough one, I’ve been trying to make it better by walking with the dog, yoga and wearing sensible shoes – yuk. Trying to strengthen my back is tough when it hurts but it can only benefit in the long run so I’m sticking with it. Movement: Oh my, this little jelly bean just doesn’t stop. People in the cinema must have thought I was terrified at a film with all the oohh’s and ouch’s I was doing but it was actually because I had Baby D’s feet in my ribs, that’s a sore one. I have to wriggle about to try and move him but the doctor says it’s a good thing because that means he is already head down. Maternity Clothes: Still no new clothes, money is tight and maternity clothes are so expensive so I’ve been making do with what I have. Must eat: Croissants!! They are so wonderful and flaky delicious I can’t get enough. Trying so hard to limit my intake to only a couple a week but I think about them every day. How sad is that?! Must not eat: Nothing really that I am avoiding which is good. Gender predictions: IT’S A BOY! What I wish people knew: That I really do want to make plans and go to dinners, movies and parties but by 8pm when everyone is meeting I am so tired I just want to relax. 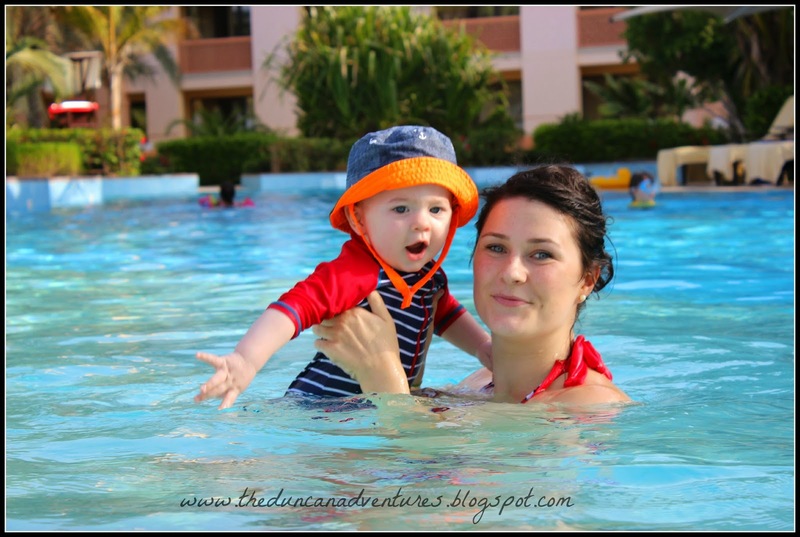 What I’m looking forward to: Getting stuck into the third and final trimester. I really want to start washing and preparing all his clothes and packing my hospital bag but I’m still very early for that! What I miss: My belly bar! We had a great 10 years together but sadly my skin just couldn’t stretch anymore. What baby is upto this week: Practicing his karate moves.. Now he can blink and see light shining through the uterus wall. His hearing is almost perfectly formed also and if there is a loud noise he jumps, at least he will be used to the noise of the dog barking. Look at this sweet little face! I wonder every day what color his eyes will be and will he have dark hair like me? 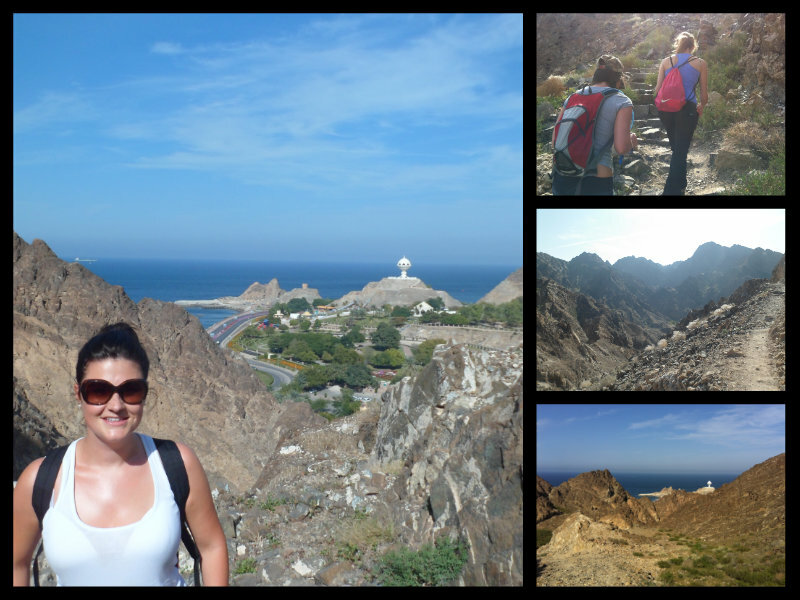 When I think of the Muttrah area of Muscat I picture the Souk (market place) and the Corniche along the sea front, little did I know that there is a hiking trail very close by. In serach of this trail I rounded up a couple of friends together, packed a picnic and headed off on an adventure. Oman’s Ministry of Tourism is promoting these kind of outdoor activities for people to get out of their cars and explore this beautiful country. To make it easier and accessible to people, the trek routes can be found on their website. So there really is no excuse not to pull on some sturdy shoes and get hiking. You can find these routes by clicking here. 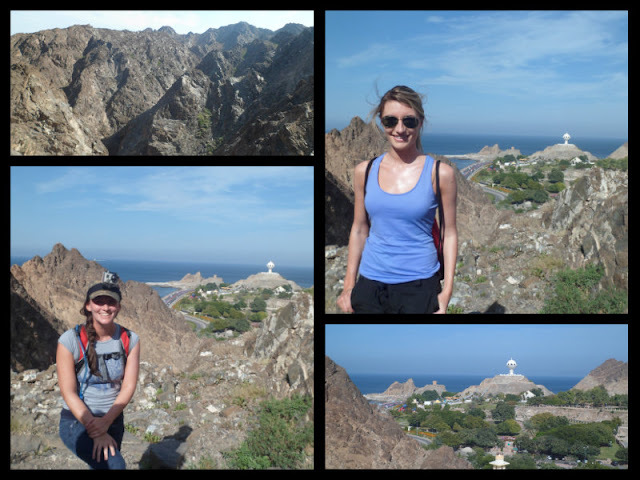 This particular hike begins from the parking area at Riyam Park in Muttrah. Look for the big gold coffee cup things, maybe they are jugs?, on the roundabouts. Once you are parked, it is not obvious at all where to go. There are steep mountains all around. Luckily, Rach figured it out, the map forgot to mention the part where you should cross the road out of the car park and go up the small hill in front of you. You will reach a yellow house with a wall all the way round the perimiter, follow the wall all the way to the back of their house and you will see a stone path going steeply up the hill next to an old diesel pipe. This is the start of the hike up the hill alongside the rusty pipe, this is a reminder of days gone by when supplies of diesel oil were pumped from a ship anchored in Muttrah harbour. This initial hike is possibly the hardest part of the entire walk. It was worth every step, though, for the spectacular views. From the top, the next landmark you can see is the distinctive Incense Burner monument. 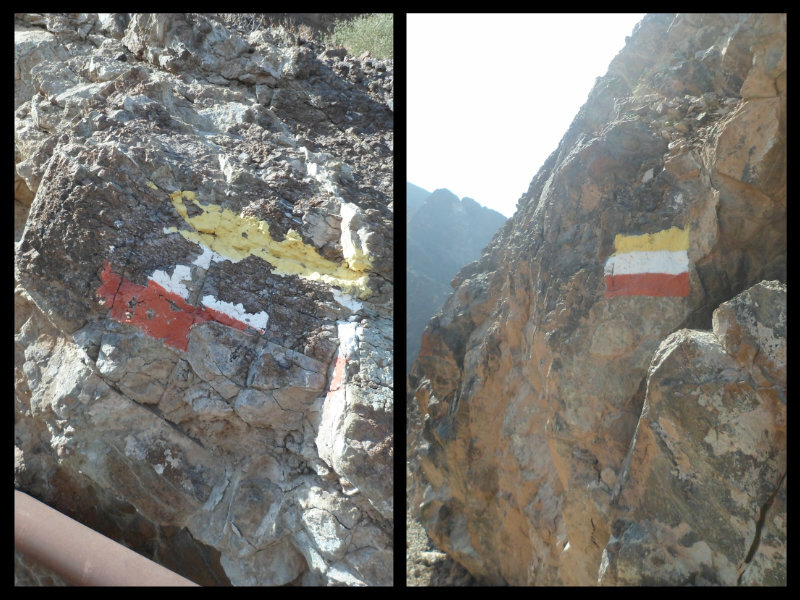 The route cuts through a wadi (valley) area for a time. This could be quite treacherous if it had rained recently, with bigger water pools and a slippery surface underfoot, so watch your step. 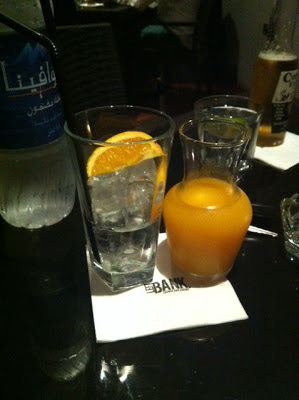 We stopped for a snack and a well-earned drink of water whilst in the wadi, where you can shelter from the sun. Though it’s rated an ‘easy’ walk, I would personally give it more of a ‘moderate’ rating. They should really recommend that you wear sensible footwear as it can be pretty steep and there are lots of areas with loose rock underfoot. Perhaps the person who rated it ‘easy’ had the balance and coordination of a mountain goat. I don’t. At times, we found ourselves having to scramble and hold onto higher rocks for balance while moving our unsteady feet down the path. I sensibly wore sneakers, which were perfect for the job. The end of the walk will take you through what is actually a grave yard, although it doesn’t look like the kind of graves we are used to, and back into the streets of Muttrah again where you can stop off for refreshments. If your heading back to your car then get back onto the main street again and turn right and follow the road back to Riyam Park. Surprisingly, we only saw two other people during our trek. It seems that people are unaware of this amazing hike in the city and tend to head further out to places like Wadi Shab for their adventures. This week my article on hiking has a two page spread in Y magazine or you can read it online by clicking here. – If you have any adventures that you would like to recommend or want me to try for you then please feel free to get in touch by using the “contact me” icon. I love a new challenge! I make no secret of the fact that I luuuurve Christmas, it makes me think of happy times as a child getting all excited and trying to force myself to sleep on Christmas Eve convincing myself that I just heard sleighbells and a reindeer outside. Then to be woken at crazy o’clock by my sister to sneak down and look through the glass door at all the presents under the tree before Mom & Pop Robertson woke up (I say we only looked, we had no choice as Pops had fitted a sliding bolt to the top of the door because he knew how sneaky we were, dammit)……Only this year it’s going to be a whole lot different. For one I have never been away from my family for Christmas so that is going to be the first big thing for me and secondly I have never been in a Muslim country over the festive season. I know my family will cope just fine without me but the question is will I cope without them? I am predicting tears on Christmas day when the reality hits me, as Colin keeps telling me “it’s only another day, what’s so special?”. I guess he is right but it is times like birthdays and Christmas that the home sickness really kicks in. Right now I am feeling it! 1- I miss the cold weather, the frost and even the snow – no chance of a white Christmas out here when its 28 degrees on the 21st December. 2- I miss the excitement and the build up to it and the saying goodbyes at work for the “see you in the New Year”. 3- I miss the presents, both giving and recieving them. I always spoil my brother as I love seeing his face get all excited before Christmas guessing what I have bought him, now that he is old enough to have a proper job he spoils me back so all those years of gifts weren’t in vain. 4- I miss Christmas decorations, lights and general festive stuff. I even miss the snowman Christmas light in Inverurie that looks more like a used condom. 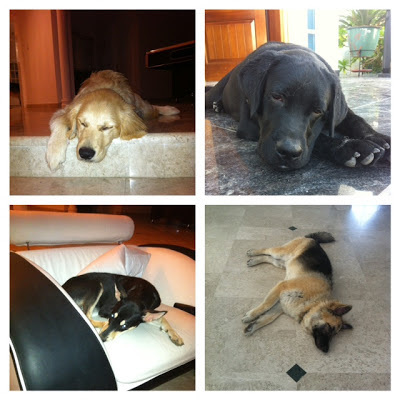 5- I miss the family bickers and my Dad getting stressed over cooking while we all snooze on the sofa. We always ask if he wants help and get a “well it’s too late now”, he loves the stress really. 6- I miss my nephews, Ben & Adam, Christmas is more magical when there are children around. 7- I miss the tradition me and my sister have that we always wear new PJ’s on Christmas eve. I even bought mine for this year, I might send her a picture of them just to keep the tradition going. 8- I miss the fact that everyone tries to get on for one day and makes an effort to be in touch just because it’s Christmas. 9- I miss the food!! Especially my favourite part, turkey and sausage meat stuffing! 10- And to sum it up, I miss the whole bloody thing!! But to think of happy times, this time last year I had my gorgeous little puppy sitting under the Christmas tree at 7 weeks old. We are lucky enough to have our friends coming over for a Christmas meal this year so we have something to keep us occupied, I will even be having my first attempt at making a turkey – wish me luck! So to everyone celebrating with their families and friends for Christmas this year, please appreciate and love each other it is that magical time of year after all and have a great time. PS- Santa if you are reading this I would like a new pair of Ray Bans and a pair of brown boots from Aldo. When I receive an email into my inbox with the title “OMG” my little gossip receptors go into overdrive, that’s surely got to be something exciting to be worthy of a title like that! The email in question came from a friend and former boss who, like me, loves a good story! The “OMG” worthy moment was to let me know that our wedding picture had made it onto the front page of the local paper back home. Now this confused me…. We got married 4 months ago and it wasn’t anything spectacular or newsworthy, so why now? The caption reads “Heather Robertson and Colin Duncan, formally of Williamson Place, Banff were married in the town and now live in Muscat, Oman”. Why do newspapers insist on printing your street address?! We had so many better pictures taken that day this one is no where near as nice as the rest but I am never happy. I look a bit of a creep with my protective hand claiming my prize haha. There aint no Tesco here! A trip to the supermarket here can be ridiculous. You really need to go during sunlight hours as after sunset when the temperature drops a little then the crowds descend like locust. And don’t even think about going at the weekend! These aren’t even the size of regular supermarkets – this is the world of the Hyspermarket. One of our favorite British pastimes is queing. We seem to love it, we que for everything – at the bank, in the supermarket and in traffic. Don’t count on peoples manners here. If you can’t beat them then your going to have to join them or you will be there for hours and I’m not joking.. Queing in traffic is only done if you really have to. Wait your turn and you will be served. If people put their trolley in your way then you can call them any name you want, freedom of speech and all that. Not here, grin and bear it. You can go at what ever time you want and your not going to have to try and play ‘Wheres Wally’ to find Colin in Supermarket over a thousand other people. Except Christmas Eve of course, anyone who goes to Tesco on that day has a death wish. Buying alcohol. You need a licence here and then have to go to a special liquor store with blackened out windows. I quite enjoyed standing in Tesco deciding how good my Saturday night out was going to be by deciding which price range of vodka to go with. Should I scrimp with Glenn’s, safe middle of the road with Smirnoff or splash out on Absaloute vodka? BUT….. Saying all that, a shopping trip can be very amusing here. You get some weird and wonderful food. If you are feeling quesey then don’t scroll down too far. A Sailfish is part of the Sword Fish & Marlin family and is now for sale at the fish counter. These are considered “big game fishing” as they are so large and can swim upto 68mph. This one has had its sharp bill sawn off, probably so some wee nugget doesn’t take their eye out with it. If you were in the market for some shark steaks you can also find these. 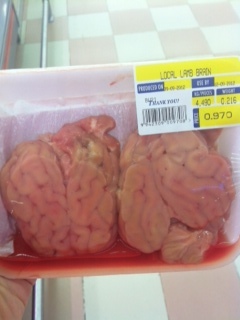 Local lamb brain anyone?! This would cost you about £1.60 but i’m not even sure what you would do with it, brain on toast? 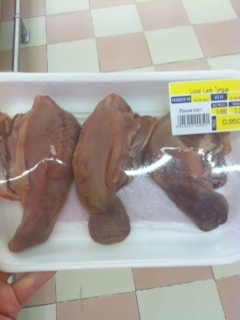 This freaked me out the most – Lamb’s tongue. It still has all the taste buds and everything still on it. Ughhh!